, a modern philosopher of high distinction, was born at La Haye in Tourain, France, April 1, 1596, of an ancient and noble family. Whilst yet a child, he discovered an eager curiosity to inquire into the nature and causes of things, which procured him the appellation of the young philosopher. At eight years of age he was committed to the care of Dinet, a learned Jesuit, under whom he made uncommon proficiency in learning. But an habit of close and deep reflection soon enabled him to discover defects in the books which he read, and in the instructions which he received, which led him to form the ambitious hope that he should, in some future time, carry science to greater perfection than it had ever yet reached. After spending five years in the diligent study of languages, and in reading the ancient poets, orators, and historians, he made himself well acquainted with the elements of mathematics, logic, and morals, as they had been hitherto taught. His earnest desire of attaining an accurate knowledge of every thing which became a subject of contemplation to his inquisitive mind, | did not, however, in any of these branches of science meet with full satisfaction. 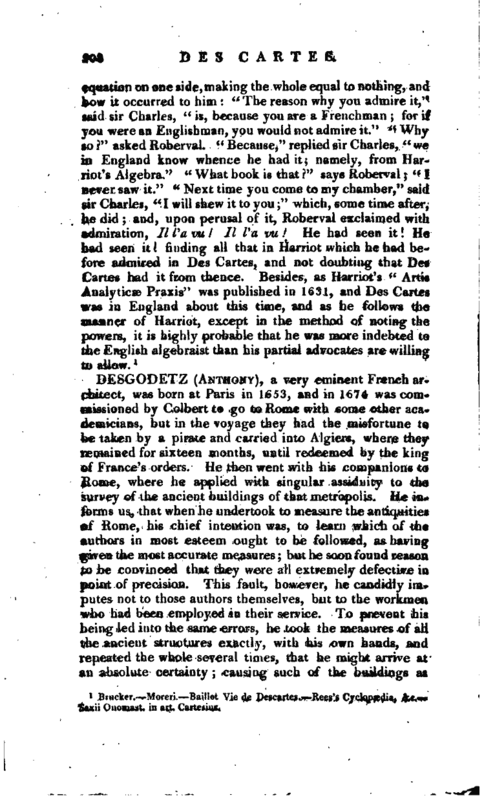 Concerning logic, particularly, he complained, that after the most diligent examination he found the syllogistic forms, and almost every other precept of the art, more useful in enabling a man to communicate to others truths already known, or in qualifying him to discourse copiously upon subjects which he does not understand, than assisting him in the investigation of truths, of which he is ignorant. Hence he was led to frame for himself a brief system of rules or canons of reasoning, in which he followed the strict method of the geometricians, and he pursued the same plan with respect to morals. 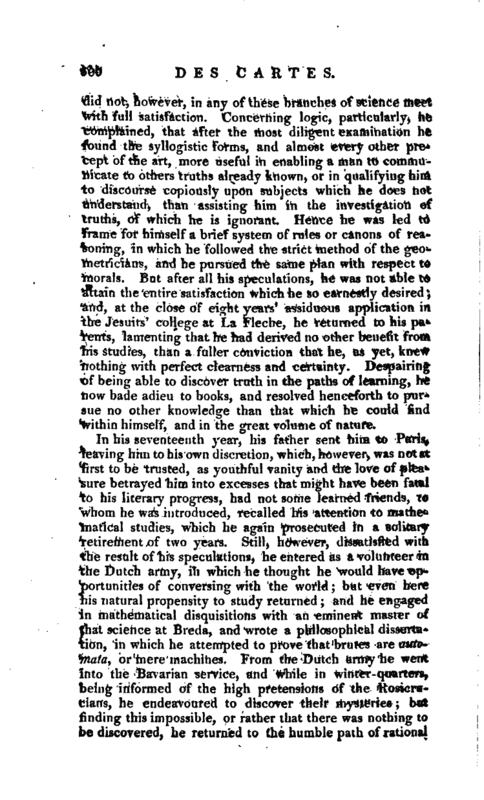 But after all his speculations, he was not able to attain the entire satisfaction which he so earnestly desired; and, at the close of eight years’ assiduous application in the Jesuits’ college at La Fleche, he returned to his parents, lamenting that he had derived no other benefit from his studies, than a fuller conviction that he, as yet, knew nothing with perfect clearness and certainty. Despairing of being able to discover truth in the paths of learning, he now bade adieu to books, and resolved henceforth to pursue no other knowledge than that which he could find ti’ithin himself, and in the great volume of nature. In his seventeenth year, his father sent him to Paris, leaving him to his own discretion, which, however, was not at first to be trusted, as youthful vanity and the love of pleasure betrayed him into excesses that might have been fatal to his literary progress, had not some learned friends, to whom he was introduced, recalled his attention to mathematical studies, which he again prosecuted in a solitary retirement of two years. Still, however, dissatisfied with the result of his speculations, he entered as a volunteer in the Dutch army, in which he thought he would have opportunities of conversing with the world; but even here his natural propensity to study returned; and he engaged in mathematical disquisitions with an eminent master of that science at Breda, and wrote a philosophical dissertation, in which he attempted to prove that brutes are automata, or mere machines. From the Dutch army he went into the Bavarian service, and while in winter-quarters, being informed of the high pretensions of the Rosicrucians, he endeavoured to discover their mysteries; but finding this impossible, or rather that there was nothing to be discovered, he returned to the humble path of rational | inquiry. Wherever he went he conversed with learned men, and rather appeared in the character of a philosopher than a soldier. At last he quitted the military profession, and after a tour through the northern parts of Germany, returned to his own country in 1622, with no other profit from his travels, as he himself confesses, than that they had freed him from many prejudices, and rendered his mind more fit for the reception of truth, an advantage of no small importance, if he could have availed himself of it. 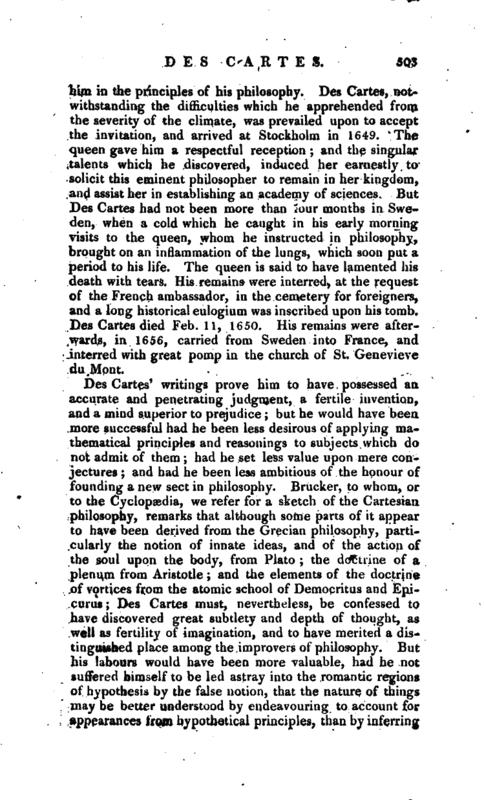 Having employed a short time in these studies, Des Cartes spent about two years in Italy, conversing with eminent mathematicians and philosophers, and attending to various objects of inquiry in natural history. He then, returned into France; but his mind remaining in an un settled and sceptical state, he found it impossible to pursue any regular plan of life, till in 1629 he determined to withdraw from his numerous connexions and engagements in Paris, and retire into some foreign country, where he might remain unknown, and have full leisure to complete his great design of framing a new system of philosophy. The country he chose for this purpose was Holland; and he went thither with so much secrecy, that the place of his retirement was for some time known only to his intimate friend, Marsenne, at Paris. He at first resided near Amsterdam, but afterwards went into the more northern provinces, and visited Deventer and Lewarden; he at lasc fixed upon Egmond, in the province of Friesland, as the place of his more stated residence. | In this retirement, Des Cartes employed himself in investigating a proof from reason, independent of revelation, of those fundamental points in religion, the existence of God, and the immortality of the soul. 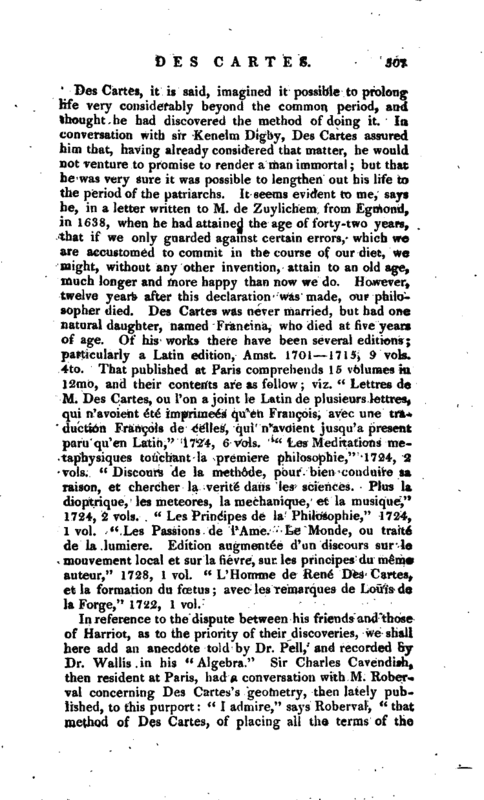 This he brought forward in his “Meditationes philosophies de pnma philosophia.” At the same time he pursued the study of optics, cultivated medicine, anatomy, and chemistry, and wrote an astronomical treatise on the system of the world; but hearing of the fate of Galileo, he did not publish it. His philosophical tenets were first introduced into the schools at Deventer in 1633, by Henry Rener, professor of philosophy, and an intimate friend of Gassendi. Not long afterwards, when he published a specimen of his philosophy in four treatises, the number of his admirers soon increased at Leyden, Utrecht, and Amsterdam: but some divines opposed his doctrines, from the dread of innovation, and even attempted to excite the civil magistrate against Des Cartes. In England, however, he was more successful, and sir Charles Cavendish, brother to the earl of Newcastle, gave him an invitation to settle in England. Charles I. also gave him reason to expect a liberal appointment; but the rebellion frustrated this design, and Des Cartes remained in Holland. In his native country, his doctrine was at first well received, but a strong party soon rose against it among the Jesuits. Bourden, one of the fraternity, attacked his dioptrics in the public schools, and a violent contest was long kept up between the Jesuits and Cartesians. 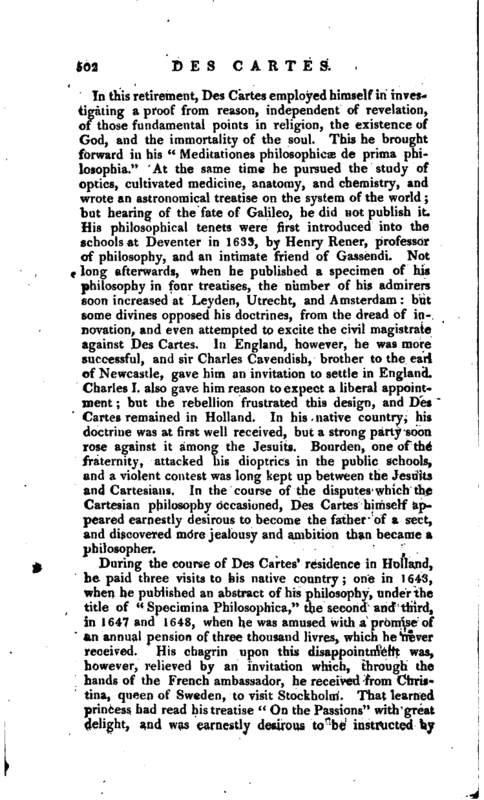 In the course of the disputes which the Cartesian philosophy occasioned, Des Cartes himself appeared earnestly desirous to become the father of a sect, and discovered more jealousy and ambition than became a philosopher. During the course of Des Cartes’ residence in Holland, he paid three visits to his native country; one in 1643, when he published an abstract of his philosophy, under the title of “Specimina Philosophies,” the second and third, in 1647 and 1648, when he was amused with a promise of an annual pension of three thousand livres, which he never received. His chagrin upon this disappointment was, however, relieved by an invitation which, through the hands of the French ambassador, he received from Christina, queen of Sweden, to visit Stockholm. That learned princess had read his treatise “On the Passions” with great delight, and was earnestly desirous to be instructed by | him in the principles of his philosophy. Des Cartes, notwithstanding the difficulties which he apprehended from the severity of the climate, was prevailed upon to accept the invitation, and arrived at Stockholm in 1649. The queen gave him a respectful reception; and the singular talents which he discovered, induced her earnestly to solicit this eminent philosopher to remain in her kingdom, and assist her in establishing an academy of sciences. But Des Cartes had not been more than four months in Sweden, when a cold which he caught in his early morning visits to the queen, whom he instructed in philosophy, brought on an inflammation of the lungs, which soon put a period to his life. The queen is said to have lamented his death with tears. His remains were interred, at the request of the French ambassador, in the cemetery for foreigners, and a long historical eulogium was inscribed upon his tomb. Des Cartes died Feb. 11, 1650. His remains were afterwards, in 1656, carried from Sweden into France, and interred with great pomp in the church of St. Genevieve du Mont. 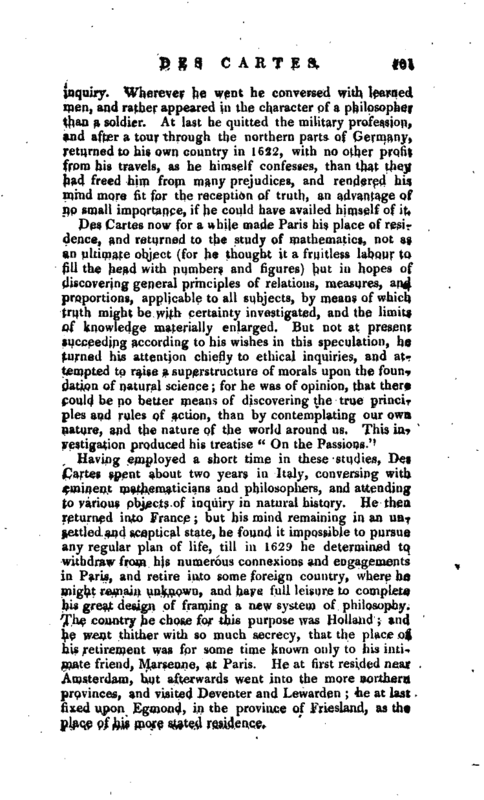 Des Cartes’ writings prove him to have possessed an, accurate and penetrating judgment, a fertile invention, and a mind superior to prejudice; but he would have been more successful had he been less desirous of applying mathematical principles and reasonings to subjects which do not admit of them; had he set less value upon mere conjectures; and had he been less ambitious of the honour of founding a new sect in philosophy. Brucker, to whom, or to the Cyclopædia, we refer for a sketch of the Cartesian philosophy, remarks that although some parts of it appear to have been derived from the Grecian philosophy, particularly the notion of innate ideas, and of the action of the soul upon the body, from Plato; the doctrine of a plenum from Aristotle; and the elements of the doctrine of vortices from the atomic school of Democritus and Epicurus; Des Cartes must, nevertheless, be confessed to have discovered great subtlety and depth of thought, as well as fertility of imagination, and to have merited a distinguished place among the improvers of philosophy. But his labours would have been more valuable, had he not suffered himself to be led astray into the romantic regions of hypothesis by the false notion, that the nature of things may be better understood by endeavouring to account for appearances from hypothetical principles, than by inferring | general principles from an attentive observation of appearances. His fondness for hypothesis led him to confound the ideas of attribute and substance, as in his definition of matter and space; and those of possibility and probability, as in his doctrine of vortices. Even his celebrated argument for the existence of God (which by the way, was maintained before his time by the scholastic Anselm) confounds the idea of an infinite being with the actual existence of that being, and substitutes a mere conception of the meaning of a term, in the place of the idea of a being really and substantially existing. Hence, though Ues Cartes is byno means to be ranked among the enemies of religion, as he was by many of his contemporaries; though it be even true, that his whole system is built upon the knowledge of God, and supposes his agency; it must nevertheless be regretted, that in establishing the doctrine of deity, he forsook the clear and satisfactory 7 ground of final causes, and had recourse to a subtle argument, which few can comprehend, and with which fewer still will be fully satislied. The system of Des Cartes, notwithstanding its defects, had so much subtlety, ingenuity, and originality, that it not only engaged the universal attention of the learned, but long continued, in the midst of all the opposition which it met with from the professed enemies of innovation, to be zealously defended by many able writers, and to be publicly taught in the schools, throughout all Europe, until at length the more sober method of philosophising, introduced by lord Bacon, began to be generally adopted. We shall now subjoin sme additional testimonies to his character. M. Baillet, in his account of his life,c. highly commends him for his contempt of wealth and fame, his love of truth, his modesty, disinterestedness, moderation, piety, and submission to the authority of the church. Dr. Barrow, in his “Opuscula,” tells us, that he was undoubtedly a very good and ingenious man, and a real philosopher, and one who seems to have b fought those assistances to that part of philosophy which relates to matter and motion, which, perhaps, no other had done; that is, a great skill in mathematics, a mind habituated both by nature and custom to profound meditation, a judgment exempt from all prejudices and popular errors, and furnished with a considerable number of certain and select experiments, a great jtleal of leisure, entirely disengaged by his own choice from | the readme: of useless books, and the avocations of life, with an incomparable acuteness of wit, and an excellent talent of thinking clearly and distinctly, and expressing his, thoughts with the utmost perspicuity. 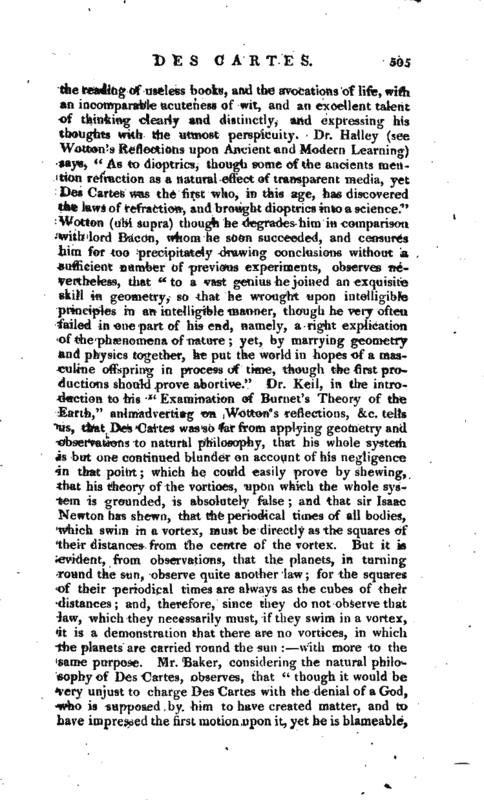 Dr. Halley (see Wotton’s Reflections upon Ancient and Modern Learning) says, “As to dioptrics, though some of the ancients mention refraction as a natural effect of transparent media, yet Des Cartes was the first who, in this age, has discovered the laws of refraction, and brought dioptrics into a science.” Wotton (ubi supra) though he degrades him in comparison with lord Bacon, whom he soon succeeded, and censures him for too precipitately drawing conclusions without a sufficient number of previous experiments, observes nevertheless, that “to a vast genius he joined an exquisite skill in geometry, so that he wrought upon intelligible principles in an intelligible manner, though he very often failed in one part of his end, namely, a right explication of the phenomena of nature; yet, by marrying geometry and physics together, he put the world in hopes of a masculine offspring in process of time, though the first productions should prove abortive.” Dr. Keil, in the introduction to his “Examination of Burnet’s Theory of the Earth,” animadverting on Wotton’s reflections, &c. tells us, that Des Cartes was so far from applying geometry and observations to natural philosophy, that his whole system is but one continued blunder on account of his negligence in that point; which he could easily prove by shewing, that his theory of the vortices, upon which the whole system is grounded, is absolutely false; and that sir Isaac Newton has shewn, that the periodical times of all bodies, which swim in a vortex, must be directly as the squares of their distances from the centre of the vortex. But it is evident, from observations, that the planets, in turning round the sun, observe quite another law; for the squares of their periodical times are always as the cubes of their distances; and, therefore, since they do not observe that Jaw, which they necessarily must, if they swim in a vortex, it is a demonstration that there are no vortices, in which the planets are carried round the sun: with more to the same purpose. 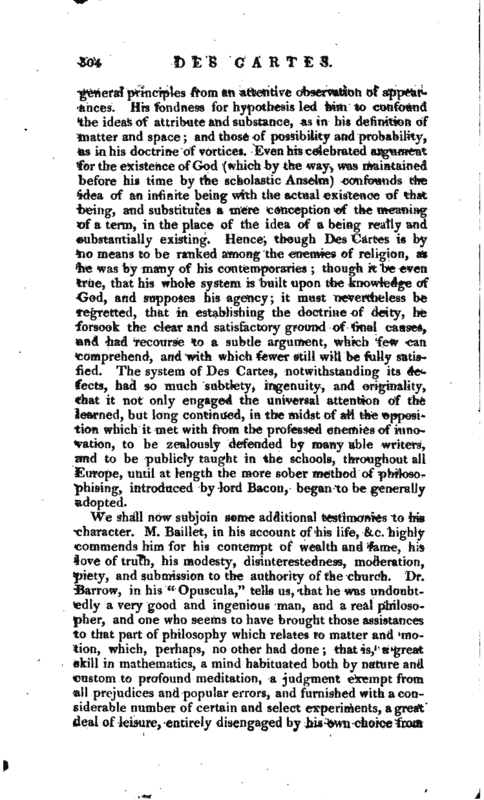 Mr. Baker, considering the natural philosophy of Des Cartes, observes, that “though it would be very unjust to charge Des Cartes with the denial of a God, who is supposed by him to have created matter,and to have impressed the first motion upon it, yet he is blameable, | that after the first motion is impressed, and the wheels set a-going, he leaves his vast machine to the laws of mechanism, and supposes that all things may be thereby produced without any further extraordinary assistance from the first impressor. The supposition is impious; and, as he states it, destructive of itself; for, not to deny him his laws of motion, most of which have been evidently shewn to be false, and consequently so must all be that is built upon them, his notion of matter is inconsistent with any motion at all; for, as space and matter are with him the same, upon this supposition there can be no motion in a plenum.” Dr. Keil condemns Des Cartes for encouraging the presumptuous pride of the modern philosophers; who think they understand all the works of nature, and are able to give a good account of them. Mr. Leibnitz, whilst he acknowledges that Des Cartes was a very learned man, and had read more than his followers imagine, and that he was one of those who has added most to the discoveries of their predecessors, observes, that those who rest entirely in him, are much mistaken in their conduct; and this, he says, is true, even with regard to geometry itself. He also remarks, that Des Cartes endeavoured to correct some errors with regard to natural philosophy, but that his presumption and contemptuous manner of writing, together with the obscurity of his style, and his confusion, and severe treatment of others, are very disagreeable. 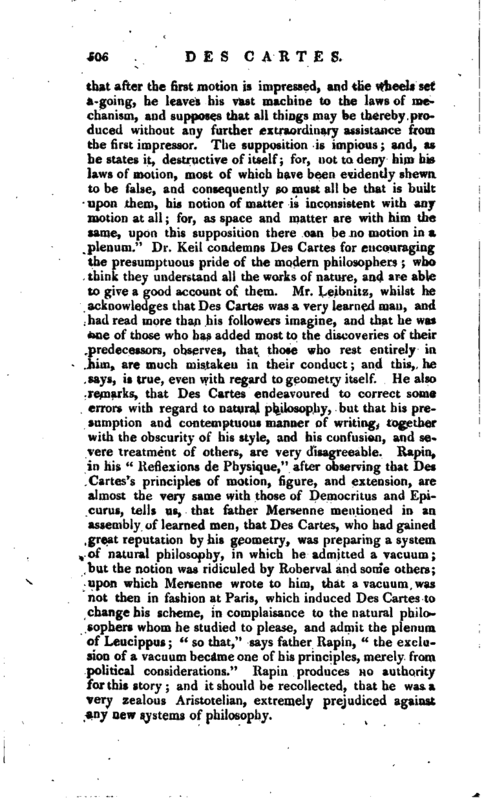 Rapin, in his “Reflexions de Physique,” after observing that Des Cartes’ s principles of motion, figure, and extension, are almost the very same with those of Democritus and Epicurus, tells us, that father Mersenne mentioned in an assembly of learned men, that Des Cartes, who had gained great reputation by his geometry, was preparing a system of natural philosophy, in which he admitted a vacuum; but the notion was ridiculed by Roberval and some others; upon which Mersenne wrote to him, that a vacuum was not then in fashion at Paris, which induced Des Cartes to change his scheme, in complaisance to the natural philosophers whom he studied to please, and admit the plenum of Leucippus; “so that,” says father Rapin, “the exclusion of a vacuum became one of his principles, merely from political considerations.” Rapin produces no authority for this story; and it should be recollected, that he was a very zealous Aristotelian, extremely prejudiced against any new systems of philosophy. | Des Cartes, it is said, imagined it possible to prolong life very considerably beyond the common period, and thought he had discovered the method of doing it. In conversation with sir Kenelm Digby, Des Cartes assured him that, having already considered that matter, he would not venture to promise to render a man immortal; but that he was very sure it was possible to lengthen out his life to the period of the patriarchs. It seems evident to me, says he, in a letter written to M. de Zuylichem from Egmond, in 1638, when he had attained the age of forty-two years, that if we only guarded against certain errors, which we are accustomed to commit in the course of our diet, we might, without any other invention, attain to an old age, much longer and more happy than now we do. However, twelve years after this declaration was made, our philosopher died. Des Cartes was never married, but had one natural daughter, named Francina, who died at five years of age. Of his works there have been several editions; particularly a Latin edition, A rust. 1701—1715, 9 vols. 4to. 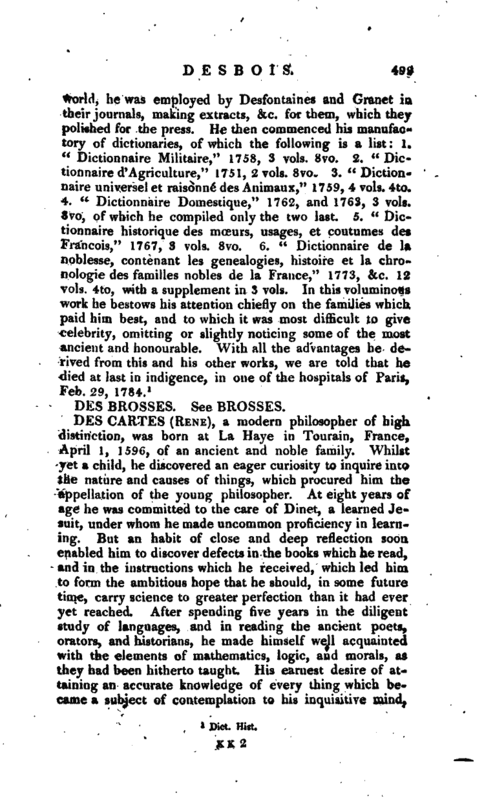 That published at Paris comprehends 15 volumes in 12mo, and their contents are as follow; viz. “Lettres de M. Des Cartes, ou Ton a joint le Latin de plusieurs lettres, qui n‘avoient ete imprhnees qu’en Francois, aver une traduction Francois de celles, qui n‘avoient jusqu’a present paru qu’en Latin,” 1724, 6 vols. “Les Meditations metaphysiques touchant la premiere philosophic,” 1724, 2 vols. “Discours de la methode, pour bien conJuire sa raison, et chercher la verite dans les sciences. Plus la dioptrique, les meteores, la mechanique, et la musique,” 1724, 2 vols. “Les Principes de la Philosophic,” 1724, 1 vol. “Les Passions de l‘Ame. Le Monde, ou traite de la lumiere. Edition augmented d’un discours sur le mouvement local et sur la fie v re, sur* les principes du mema auteur,” 1728, 1 vol. “L’Homme de Rene Des Cartes, et la formation du fetus; avec les remarques de Louis de la Forge,” 1722, 1 vol. Bmcker. —Moreri. -TJaillet Vie de Descartes. Rees’s Cyclopædia, &e.-^ Saxii Ouoinast. in art. Cartesius.